Shona gave the validictorian speech at graduation this year. 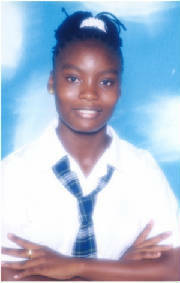 She is presently attending Queen's College and preparing for CAPE - Caribbean Advanced Proficiency Exam. Hobbies: Meeting people, reading, visiting interesting places, listening music, laughing and surfing the net. This site is the official Kuru Kuru Co-operative College web site.